It feels so good to be home for Christmas! Getting back into the kitchen has been one of the best parts (and just being home in general!). Leah and I got home pretty late Wednesday night, and Thursday we looked around the kitchen to see what we had and noticed there was a bag of cranberries in the fridge. 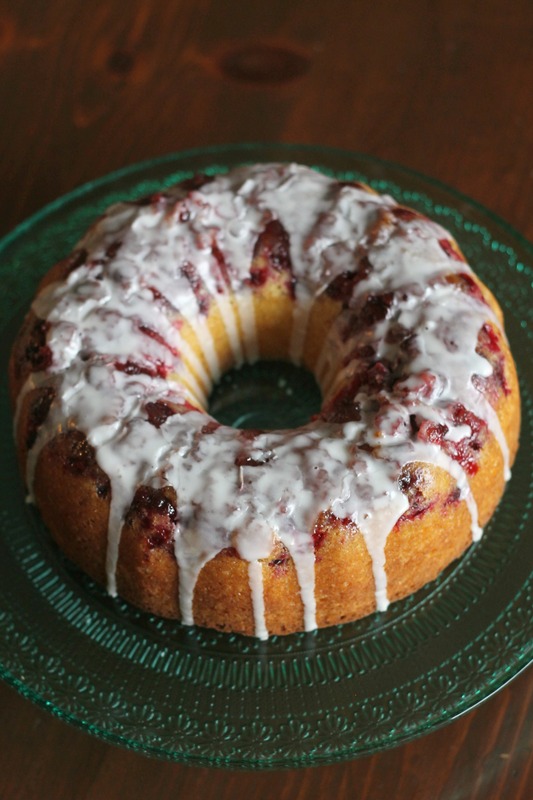 Conveniently, earlier in the week we had both spotted this awesome-looking cranberry lemon upside down cake on a blog we read and we decided to give it a try. 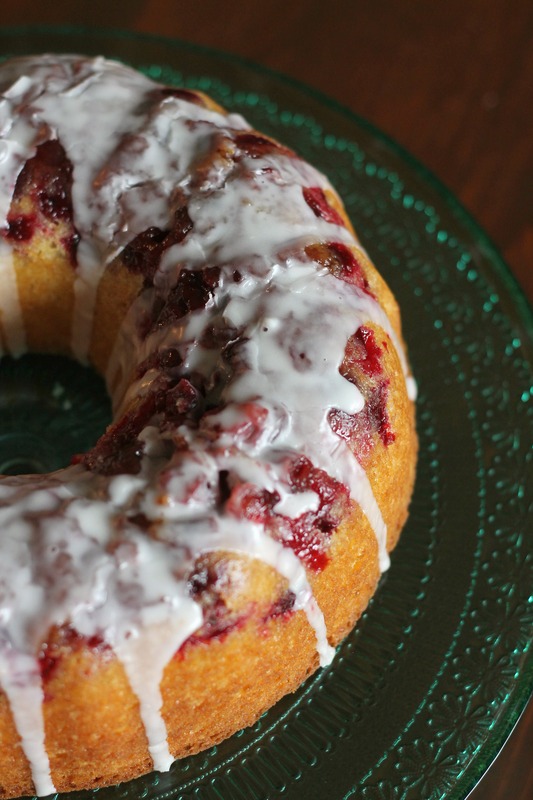 Bundt cakes are delicious, but usually there’s only so much you can do with them in terms of making them look pretty. This cake, though, has the jewel-like layer of cranberries on top, which makes it very festive- perfect for any Christmas gathering! The cake itself is a simple lemon buttermilk cake that is fast to whip up. You layer cranberries in the bottom of the pan with brown sugar and then pour the batter on top so that the cranberries are visible when you invert the cake. A quick lemon glaze tops it off and it’s ready for serving! We all loved this cake and it’s sure to become a Christmas favorite for years to come! Preheat the oven to 350˚ F. Grease a Bundt pan with butter. Sprinkle the brown sugar over the bottom of the pan in an even layer, then layer the cranberries over the sugar. In a medium bowl, whisk together the flour, baking powder, baking soda and salt. In the bowl of an electric mixer combine the granulated sugar with the lemon zest. Rub the zest into the sugar with your fingertips to infuse the sugar with the lemon fragrance. Add the butter to the bowl with the lemon sugar and beat on medium-high speed until light and fluffy, about 2 minutes. Beat in the vanilla. Add the eggs one at a time, scraping down the sides of the bowl when needed. In a measuring cup, combine the buttermilk with 2 tablespoons of the lemon juice. With the mixer on low speed, add the dry ingredients in three additions alternating with the buttermilk mixture, beginning and ending with the dry ingredients. Mix each addition just until incorporated. Spread the batter into the prepared pan over the cranberries. Bake about 50-55 minutes or until golden brown on top and just set (a tester inserted in the center should come out free of crumbs). Transfer the pan to a wire rack and let cool about 15 minutes. Invert the cake onto a serving platter, remove the pan and let cool completely before glazing. To make the glaze, combine the powdered sugar with 1½ tablespoons of the lemon juice in a small bowl and whisk until smooth. Drizzle the glaze over the cake and let set before slicing and serving. Enjoy!